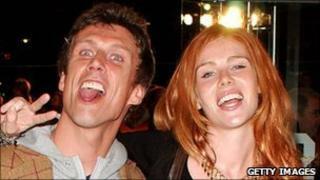 Ex-Happy Mondays dancer Bez has been questioned by police over allegations he breached a restraining order by contacting his ex-girlfriend. Monica Ward claimed he had sent text messages and made phone calls since being convicted of assaulting her. Bez - real name Mark Berry - was jailed for four weeks in August and told he must not contact her for two years. Greater Manchester Police (GMP) had been looking for him but said he attended a police station on Monday. He was arrested and questioned by officers, before being bailed pending further inquiries until 17 November. Bez had been living at a friend's house in Urmston, Greater Manchester, but had disappeared following the fresh claims. The singer, who found fame for his dancing in the Happy Mondays in the late-1980s, flew into a rage about money and throttled Ms Ward - the mother of his two-year-old son - in May. He was originally given a community service order for committing the assault but refused to comply with the sentence and was then sent to prison by Manchester magistrates. He has maintained his innocence throughout. Last month he lost his appeal at Manchester Crown Court to overturn his conviction and was also ordered to pay £500 costs. "It's a joke," Bez said from the dock. "I'm going to take this to a higher court. I'm not paying nothing."